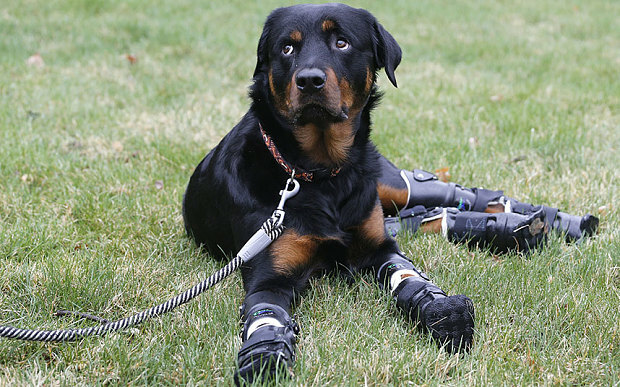 This adorable 2-year-old Rottweiler’s name is Brutus, and he gets around using four specially designed prosthetic paws! Brutus was left out in the freezing cold as a puppy and developed frostbite. His owner decided to amputate all four paws, and eventually gave him up for adoption. Lucky for Brutus, someone noticed him in a store parking lot in Colorado, where he was looking for a new home. Hundreds of people donated money to give Brutus a new lease on life and four new paws! Brutus’ new owner, Laura Aquilina, says she just wants to give Brutus the gift of being a regular dog. Felix Deurr, an orthopedics professor at Colorado State University, says prosthetics like Brutus’ have only been around for about 15 years and not all dogs get used to them. A study reviewing their effectiveness is due out later this year. 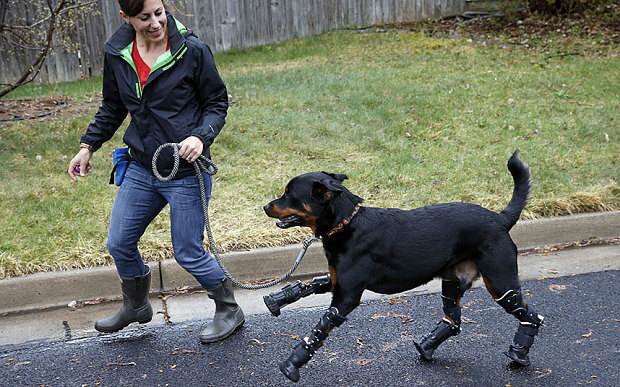 According to NBC News, Brutus is the second dog in history to receive four prosthetic limbs. Aquilina says if Brutus doesn’t take to the prosthetics, she will move on without them, but by the looks of this video, Brutus is doing just fine!